lovers and have been our entire life, some 45+ years. 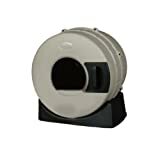 We’ve compiled an extensive list of reviews and continue to add new updates so you’ll be able to find the top cat litter box for your environment. Although we’ve not personally tested every cat pan on this site we have quite a bit of experience with many and have researched extensively the brands mentioned. What this means to you are some easy to follow guides and charts so that your able to match the right pan for your environment and budget. One big benefit that you have is there’s a lot of product choices to choose from. They have come a long way from the very simple plastic pan of yesteryear all the way up to the high-tech automatic boxes of today. There’s even some incredible (an funny) looking furniture to hide your pan under if you choose. So whether your looking for traditional approach or something that’s fully automated we cover the whole spectrum. We’re also here to help answer any of your questions so please don’t hesitate posting any comments. If you haven’t picked out your new feline friend than start by visiting the Cat Humane Society. Here you can find where your local branch is and other great information. It truly is rewarding to give an animal a new home. 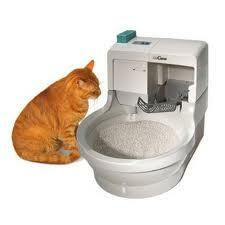 Is An Automatic Cat Litter Box For You? a lot of the “chore” out of cleaning duties. They come in many styles and variations which we go much more in-depth below and other pages. As you can image some have better success rates than others (please review the charts) and are of higher quality. However with just about any product there’s usually a sweet spot where you get the most bang for your buck, we list a couple great choices below. What’s important is you give your cat ample time to get used to their new restroom. Cats can find it difficult to adapt to changes, so asking them to go from a traditional box to walking into something that looks like Yoda’s house can be a challenge. Quite frankly, there will be a percentage of cats that just won’t accept an automatic box however this is very minimal. Adding a litter mat is also a good addition to a new litter box. They come in multiple colors like Grey, Green, Blue, Red and Brown. Automatic cat boxes are great especially in a multi-cat environment (although it’s aways a good idea to have more than one box available) and especially for people that travel frequently. 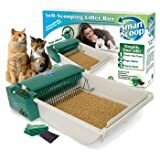 They can be a big help keeping the cat litter dust down which can be significant for people that are allergic to litter. What Are The Top Automatic Box Questions? Here are answer to some of the top questions regarding automatic units. How Much Do They Cost? Prices start around $50.00 dollars and go up to around $400.00 although some extremely high end ones can even be more however we’re only going to cover the most popular ones that 95+% of the market use. Are They Safe? Because there are powered mechanics involved the concern is “what if” it comes on while my cat is still in the box. In answer to the question they are extremely safe however we always recommend you read the product disclaimer and contact the manufacturer with further questions. We’ve been involved in the cat community for quite some time and have never heard of a story involving a cat being hurt. They are primary designed around your cats safety. How Noisy Are They? On average not much, certainly nothing that will make you wake up during the night unless your an extremely light sleeper. Each product will vary somewhat. What Features Do They Have? 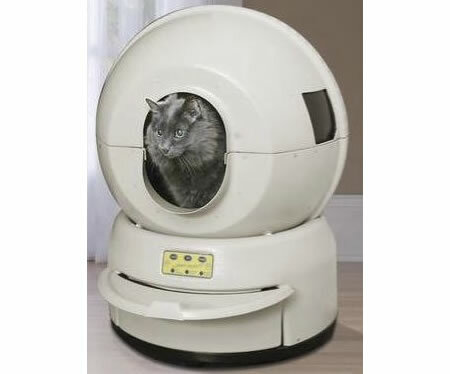 There’s lots of features that very by model, some popular ones are: Ability to leave a week at a time unintended, Quiet motors, Easy cleanup, Time saving, Healthier (reduced dust and a cleaner box for your cat), Better odor control, Additional privacy for the cat depending on model. Do They Require Special Litter? For the most part no however some products will have a specific recommendation. We’ve found some of our own personal favorite litters and share those on this site. How Are They Powered? Most plug into the wall, some have an optional battery option to run in the case of a power outage. Yes, your sump pump may not be redundant but your cat box can be. What Are My Choices? You have several choices of boxes here. We’re here to help. Are you trying to solve why litter is flying all over? Are you going to get a cute new kitten? Maybe it’s just time for something new and you want the right products for your cat. 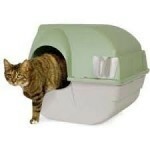 Our automatic box reviews and ultimate comparison guide is a start for finding the best litter box for your environment. It’s amazing how many choices are available. It could be you have a few cats and your vet said Get another box! You need more boxes. You came to our site and we want it to be fun shopping, not overwhelming. We cover all that you want to know and more on our site to find the right product for you and your feline friends. 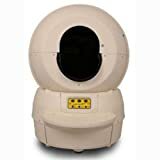 Reviews and articles as well as below you will find an easy to sort list featuring automatic & manual cat boxes. Automatic boxes do most of the not so fun clean-up work for you. No worries! We cover the more traditional, manual scooping boxes too! You’ll be surprised at your options and learn while you decide which box is the recommended to buy. Come and stay awhile and we’ll assist you with your decision. There are so many options in the world of cat boxes. We are helping by highlighting a few on your way to making a decision. Our site will show you a wide price range and variety. Did you know some kitties can jump in a box from the top? They can hide out while doing their business in privacy. Take a look at these tips to guide you on choosing the right one. Here’s a great article and video on how to train your cat and eliminate that cat urine smell. We’ve compiled lots of data to help you select the top cat food. If you have one of the small percentage of cats that are non-receptive to an automatic boxes or if you prefer one that is traditional then good news! Here are some of the top choices that aren’t automatic and are cost effective. Traditional litter pans have come a long way to where you can still simplify duties without investing in an automatic. What’s a great cat pan without a top rated super scooper? It’s hard to believe but not all scoopers are the same as you may have already learned. We recommend the Duranimals DuraScoop Cat Litter Scoop (colors may vary) as we’ve found it to be of high quality and durable, especially in a multi-cat environment of Big Eaters! If we added up all the “cheap” scoopers we’ve purchased it would be much more than the years of service this one has provided. It’s easy to clean and maintenance too! One of the things we like to do is save the grocery bags for scooping duty. We usually double-bag everything at the store anyways so there’s alway ample bags available. You can also find a large selection of grocery bag holders to store them, some are hilarious. We’ve found over the years that cat’s like a clean box, so we clean our every day and have had great results of not having issues. We’ve dedicated a unfinished half bath in the basement as the “cat restroom” and have dual boxes and it’s worked great. Don’t forget other accessories for your feline friend. Cats love to stay perched up on cat shelves where they can oversee everything. Every cat loves a heated bed, and don’t forget to check out the automatic cat feeders and water fountains. Some cats that are primarily indoor meows are thrilled with the opportunity to see the outdoors every now and then. One of the simplest ways is outdoor cat enclosures. Whatever you do don’t forget about the #1 cat item which are cat trees. A good friend of ours (Meow Mommy) has introduced a brand new cat scratcher to the market. This premium cat scratcher will help keep your cat entertained and center it’s attention of sharpening its claws away from your furniture. Be sure to check out the review. There’s always pros and cons to your choices, right? 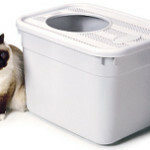 You can still maintain a budget and choose a great cat box. We are highlighting some of our favorites and those that received top ratings from happy cat customers. 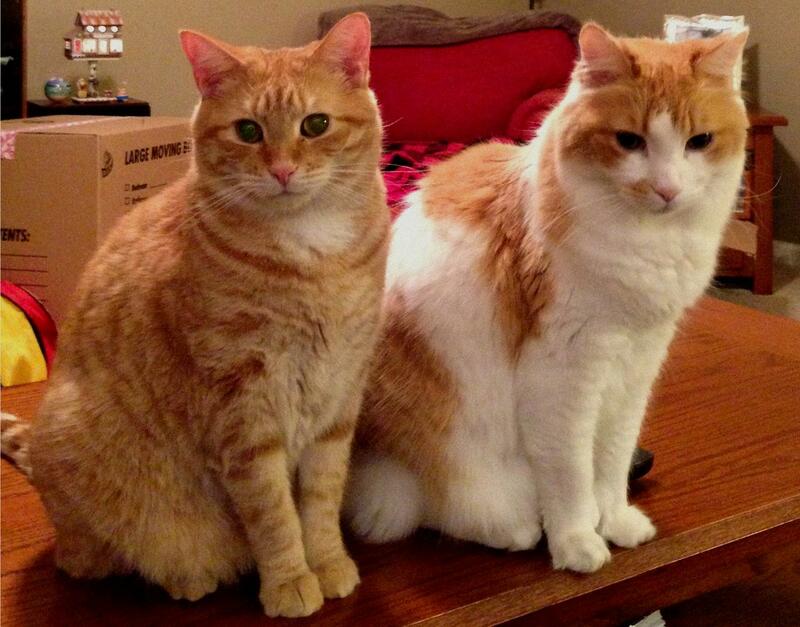 Customer reviews of Clevercat show how happy they are because they see almost no litter outside of the box. They’re also happy because no more over the side spills or spray happens. Another bonus is that it’s almost dog-proof. Cats easily adapt to this style of box and enjoy the privacy. Using liners is not required. This box is not recommended for kittens, large cats, seniors or disabled. The Omega Paw is a kind-of hybrid on self-cleaning by the owner simply rolling the box and then rolling it back again. 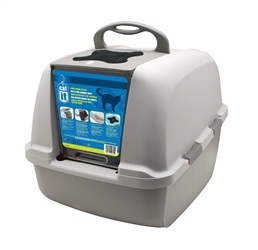 It places kitty waste in an easy removable tray and uses clumping litter. Having a detachable cover, it also controls the over the side spills as well as flying litter. The process is faster than the normal scoop routine. More happy owners on this one again with solving the flying litter debacle every cat owner knows. 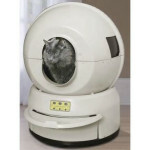 At first, the Litter Robot looks like a space capsule, doesn’t it? It’s one of the highest rated automatic cat, available and highly rated by cat owners who choose to spend just a little bit more. Kitties take some time to love it and think they aren’t going to the Meow Planet but owners are still pleased because they adjust. Kitty waste goes into a drawer under the Litter Robot and all the cat owner has to do is remove the liner. The expensive must be well worth it because of its popularity. You’re right. This one looks and acts like a kitty toilet and it’s very popular. This one is a little more complex and expensive, and it does hook-up to your cold-water supply requiring it to be located in certain spots in your home. 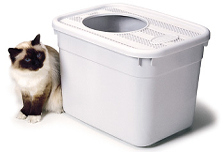 It’s unique design completely washes and sanitizes itself which is a great priority for some owners who don’t like to regularly super clean their cat box. Another one that solves the flying litter debacle. The Catit Jumbo Hooded is a top choice because of it’s popularity in size and ability to trap the litter. Cats can easily turn around and find the right spot with this box. Catit Jumbo is perfect for those of us who have a few cats and fat cats. It provides the space and privacy cats love. Owners are also happy with the fun feature of changing the top to be more like a moon roof where the cat can stick their head out. It’s also in a less expensive price range. Doing research takes time and helps in making a good decision. 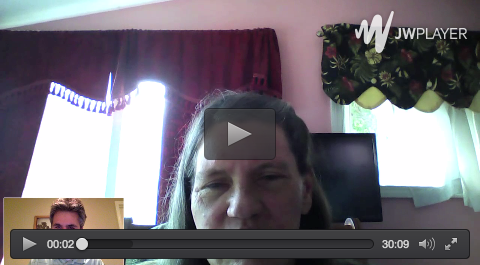 Take a look around our site including video reviews. You’ll find articles on specific products and other information for you to choose one of the many varieties of products on the market. Remember, the box you select has to appeal to your cat and may take some transition to adjust to a new box. When blending your new box into the home, don’t immediately move the box to a new location or at least keep the old box in its location until you know your cat takes to the new one. 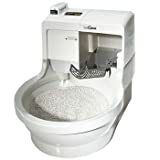 Don’t forget about cat litter box furniture, yes, their is lots of varieties available that can give that special cat bathroom area some pazazz. You might be surprised how customized this furniture can be from very funny to very elegant! So now you have the resources to equip yourself with the finest cat box, litter and accessories, just add cat. We hope that you’ve found this information useful. If you have any question please feel free to drop us a line, we’d love to hear from you or post a comment. If you love your pet(s) like we do then you know happy pets make a happy home. We’re glad that you stopped by.